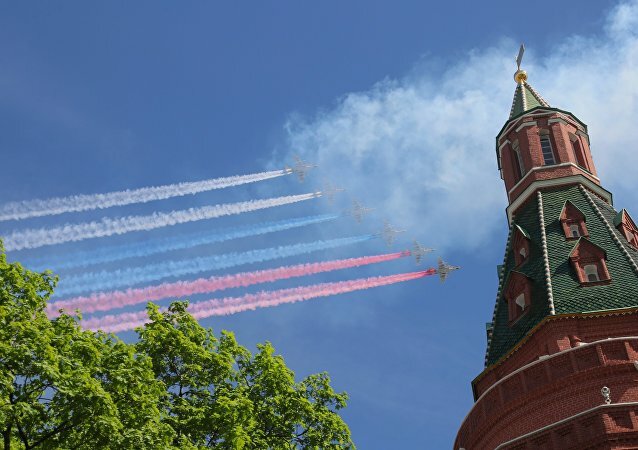 A military parade to honor the 73nd anniversary of the end of the Great Patriotic War is held on Moscow's Red Square. Among the 70+ aircraft set to take part in the aerial portion of this year's parade is a pair of Sukhoi Su-57 stealth fighter jets, which will be making their parade debut. In addition to this, the Kinzhal hypersonic missile designed to preserve the global strategic balance, which was revealed earlier this year by Russian President Vladimir Putin, carried by the MiG-31 supersonic interceptor fighter, will also make its debut this year. 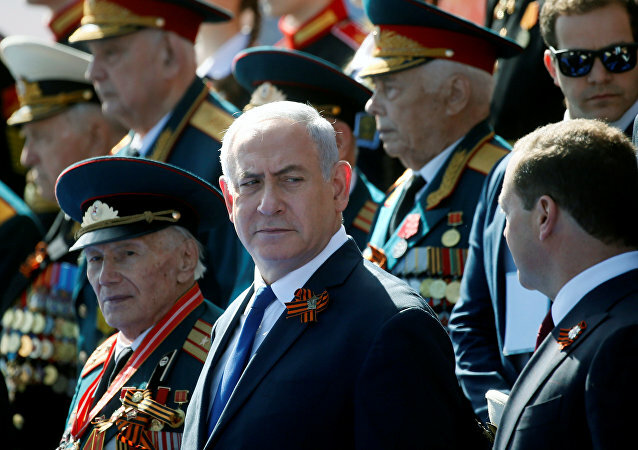 Netanyahu will hold talks with Putin later in the day. The visit comes just a day after the US president announced exit from the Iran nuclear agreement, as well as following an Israeli airstrike in Syria. Glory to veterans of the 1941-1945 Great Patriotic War! Long live the 73rd anniversary of the Great Victory! We are hearing the joint performance of servicemen from the 154th Separate Commandant Preobrazhensky Regiment, cadets of the Moscow General Khalilov Military Music School and musicians from the Parade Orchestra of the Moscow Garrison. Its creation was announced by President Vladimir Putin in March in order to ensure the global nuclear parity. MOSCOW (Sputnik) - Ten MiG-31 interceptors (NATO reporting name: Foxhound) with Kinzhal ("Dagger") hypersonic missiles able to penetrate air defense are on trial combat duty and ready for use, Russian Deputy Defense Minister Yuriy Borisov said. The Russian Defense Ministry has commented on President Putin's annual state-of-the-nation address to the bicameral parliament, the Federal Assembly, to a large extent devoted to the country's success in the military sphere. 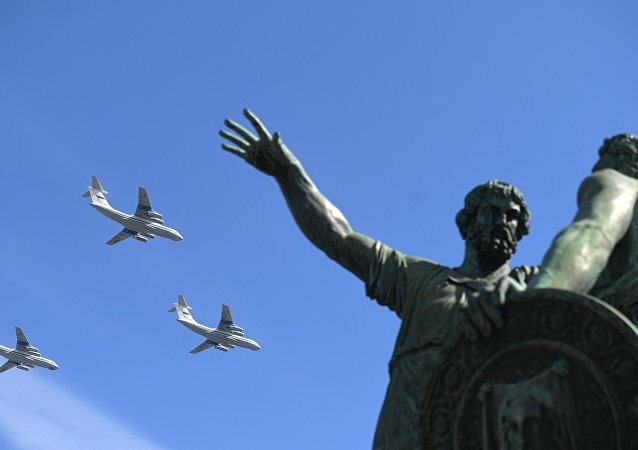 The group of three planes we now see above the Mausoleum are modernized multipurpose Il-76MD freighters. 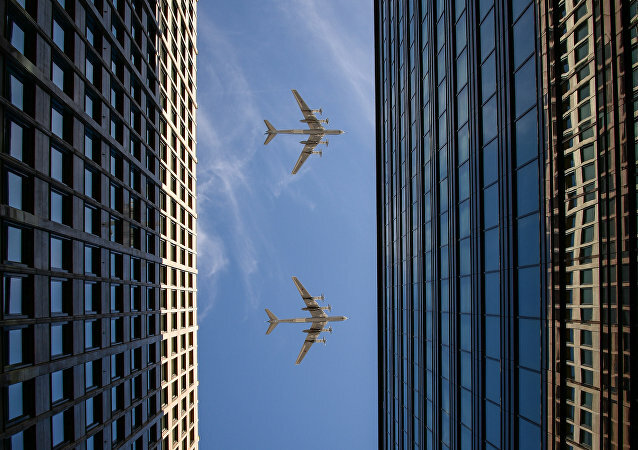 The flying altitude of the helicopters is 150 meters, with speeds of 200 kilometers per hour. The Mi-26's cargo capacity stands at 20 tons. The army aviation is represented by the Berkuty aerobatic team with their Mi-28H Night Hunter attack helicopters. The Yars units remain the backbone of the mobile group of Russia's nuclear forces. Its special vehicles include Tigr, Patrul and Ural armored cars. The S-400's combat characteristics remain second to none as compared with other missile defense systems. It is capable of destroying both current and advanced means of air and space attack. 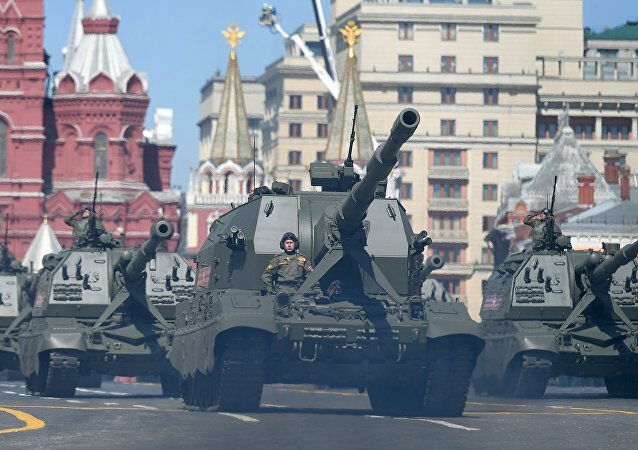 Air defense units of the 4th Guards Kantemirovskaya Tank Division enter Red Square. The Tor-M2 system is taking part in the parade for the first time. The new generation of anti-aircraft systems reliably protects tank crews when they are on the march or in combat. Thanks to its unique technical characteristics, the systems can be used for launching high-precise and deadly strikes. 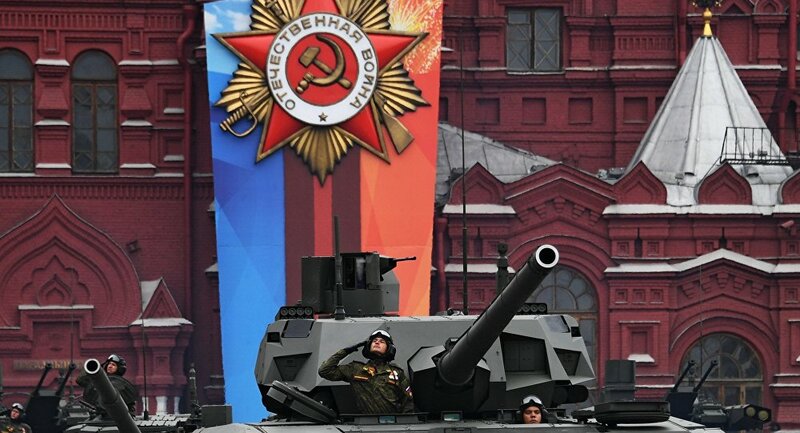 The motorcade consists of the modern generation of Russian armored vehicles, such as the T-14 Armata tank, the main battle tank T-72B3 and the tank support vehicle Terminator. A motorcade of armored vehicles of enhanced protection, the Typhoon-K and the Tigr-M, from the military police of the Russian Defense Ministry is passing by. The motorcade is followed by a parade of infantry fighting vehicles designed for providing fire support to motorized rifle divisions. 74 years ago, the brigade's personnel along with other units seized Mount Sapun and liberated the city of Sevastopol. During the Second World War, the Division was involved in the defense of Moscow and the Caucasus. The Ministry units remain on heightened alert every day, and they are ready to successfully fulfil search-and-rescue operations when grappling with emergency situations in Russia and beyond. Right now, the military police jointly with their colleagues successfully implement combat and special tasks to maintain security and order in the cities and settlements in Syria. 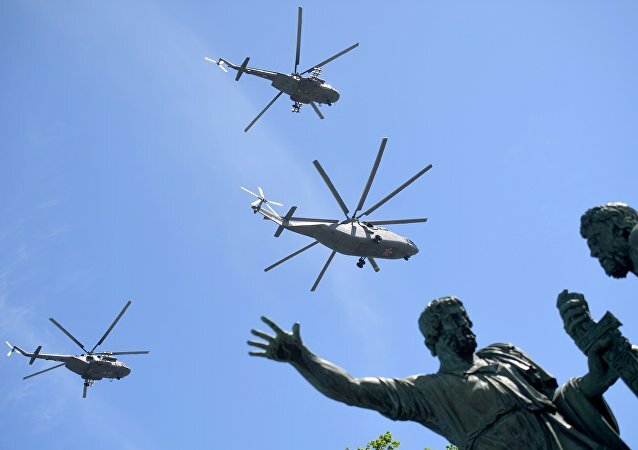 For the first time in Russia's modern history, the Ryazan Higher Airborne Command School, which marks its 100th anniversary this year, has been decorated with a "guards" title for its graduates' heroism, selflessness and courage. The Academy prepares officers for operating all types of modern and advanced Russian missile systems, including Yars and Sarmat. Female graduates of military educational establishments hold posts of military translators and communication specialists, also working in logistics and financial services. Since the Second World War, the marines' motto has been "The Victory is Where We Are!" Cadets of the Admiral Ushakov Baltic Maritime Institute and the Naval Polytechnic Institute are taking part in the parade. The academy prepares military engineering personnel for the Russian army and other law enforcement agencies. Right now, the Academy's graduates continue the traditions of senior generations and implement tasks related to fighting terrorism in Syria and other hot spots. It prepares officers for the Ground and Airborne Troops as well as Navy and for all types of anti-aircraft systems. 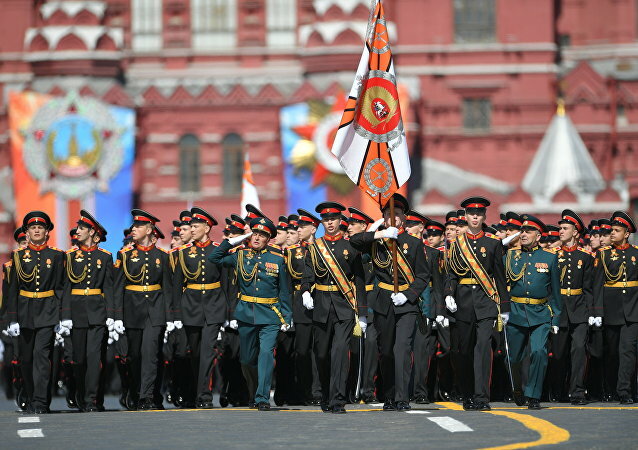 Cadets of the Military University of the Russian Defense Ministry enter Red Square. The University remains Russia's only higher military-humanitarian educational and scientific center for training officers. The renowned University is approaching its 100th anniversary; and continues to improve its educational processes by using the most innovative modern technology. Entering the square are attendees of the Military Academy of the Russian Armed Forces, which is commemorating the 100th anniversary of its foundation this year. The parade unit is headed by the academy's headmaster Lieutenant General Alexey Avdeyev. 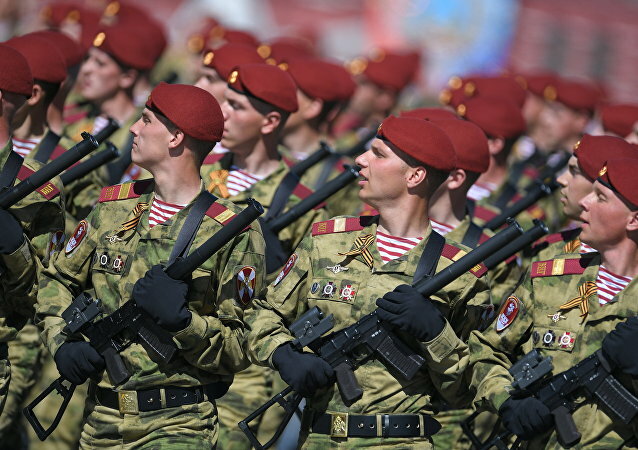 The unit created at the initiative of the Russian Defense Ministry is active all regions of Russia and includes more than 20,000 boys and girls in its ranks. It is headed by Olympic champion Dmitry Trunenkov, the head of the General Staff of the movement. The past 75 years have seen more than 16,000 boys proudly wearing scarlet shoulder boards and announcing themselves as cadets of the Suvorov Military School. 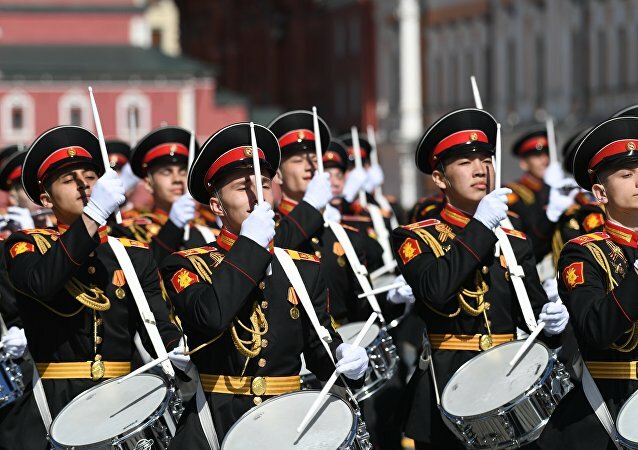 A company of the Moscow Suvorov Military School under the command of Colonel Igor Yekimov are marching on the Red Square. Young musicians define the tempo and rhythm of parade units. Attempts to rewrite history and justify Nazis and their collaborators are absolutely intolerable, President Vladimir Putin said in a message to participants in a conference on the Soviet and Chinese role in defeating German Nazism and Japanese militarism during WWII. "Russia is open to dialogue on all issues of global security, ready for constructive, equitable partnership for the sake of harmony, peace and progress on the planet. War is always a challenge to life itself, to everything best in it. We remember the tragedies of two world wars from history lessons. They do not let us be blinded, the same old ugly egoism and intolerance, aggressive nationalism and claims of exceptionalism are behind new threats. We understand the seriousness of these threats." "All nations understood that Nazism was defeated due to the Soviet soldier. However, today there are attempts to obliterate the feat of the people, who saved Europe and the world from slavery, from extermination, from the horrors of the Holocaust, attempts to distort the events of the war, to bury the true heroes into oblivion, to forge, rewrite, falsify the history itself. We will not allow this, never. Our duty is to preserve the memory of the valor of soldiers, who lost their lives for the sake of the lives of others." RuDefense Minister Sergei Shoigu completes the inspection of troops and moves towards the central reviewing stand to report to Russian President Vladimir Putin, Commander-in-Chief of the Russian Armed Forces. 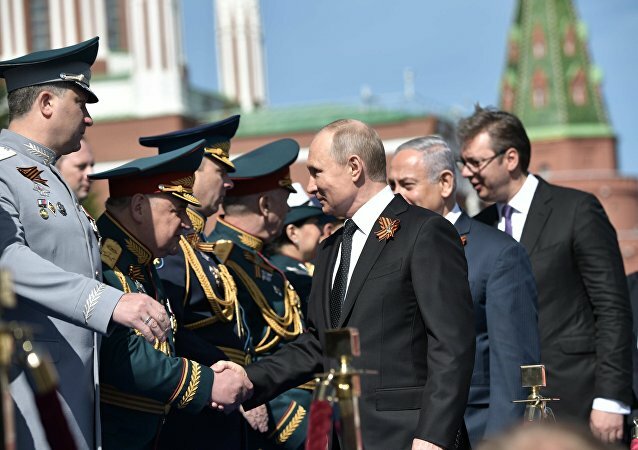 The Defense Minister also welcomed the youngest participants of the parade – cadets of the Suvorov and Nakhimov military schools as well as members of the Russian military-patriotic movement Yunarmiya (Young army). Military hardware and aircraft from all branches of the Russian Armed Forces as well as the parade groups of other law enforcement agencies. Ground troops will be the first to be hailed by General Shoigu. 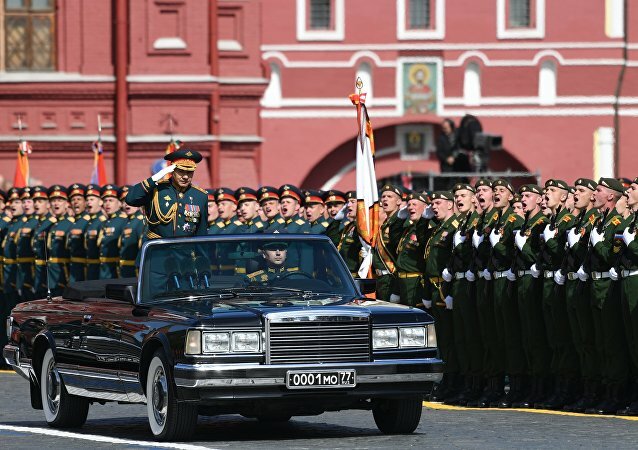 General of the Russian Ground Troops, Col. Gen. Oleg Salyukov, is commanding the parade. Their unprecedented heroism and courage during the defense of Brest, Odessa, Sevastopol, Smolensk, Tula, Leningrad, Moscow and Stalingrad thwarted Hitler's blitzkrieg and related plans to defeat the Soviet Union. Those who worked in wartime industry contributed considerably to the victory. Their selfless toil helped restore production in record time and provide the Red Army with the necessary amount of military hardware and ammunition. The national flag of the Russian Federation and the Victory Banner of the 1941-1945 Great Patriotic War are brought into Red Square by Sergeant Anton Mikhailov and Junior Sergeant Alexey Fokeyev from the 154th Independent Commandant's Preobrazhensky Regiment. 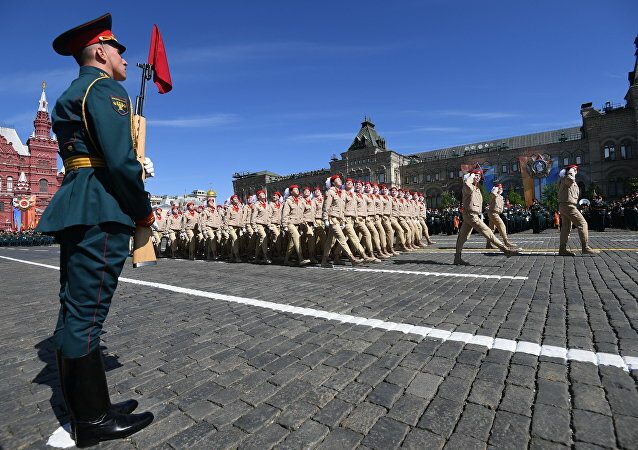 The parade marks the 73rd anniversary of Victory in the 1941-1945 Great Patriotic War.